Safal Steel believes that, as South Africans, we have so much to be proud of; that we have every reason for our blood to pump green and gold. And just as we watch and cheer our sporting stars as they excel, we should also acknowledge the accomplishments of industry. Safal Steel is an aluminium zinc coating mill, based in Cato Ridge. Having produced more than 150 000 metric tons of aluminium zinc coated steel since the Metal Coating line was commissioned in 2006, the company has covered in excess of 45 000km of steel. Trade and Industry Minister Rob Davies identified the Steel industry as one of the largest contributors to the manufacturing sector, at the official opening of Safal Steel in March 2012, and the Safal Group, together with the DTI and the IDC, has demonstrated commitment to this industry with substantial investment in Safal Steel.  Transport: At full production, the company will have, on average, 25 heavy-duty vehicles moving through the premises daily.  Other support industries include, gas, ESKOM, cleaning, maintenance of equipment, material supply and hospitality, through the hosting of local and international guests and delegates. Safal Steel committed to environmental sustainability. 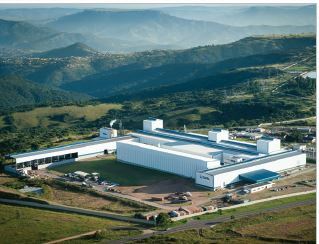 A Greenfields operation, the facility is a fully self-contained coating operation which commences with the Pickling and Oiling of Hot Rolled Coil, to Cold Reducing the metal to base metal thickness, to the Metal Coating Line; which coats the steel with aluminium zinc and a pre-painted line which paints the material with a modified polyester paint system if required. The operation is entirely self- contained, as far as waste and emissions are concerned, and a stringent environmental impact assessment was undertaken prior to construction. The matte finish and small uniform spangle of ZincAL® provides maximum heat reflectivity. This keeps the interior of a building cooler in summer months and significantly warmer in winter months. The addition of paint will aid in further reflectivity ratings. Based on the lightest colour in our Palette Sea Spray, this paint system has a SRI (Solar reflective index) of 65%. The technique of coating steel with an alloy of aluminium zinc (55% aluminium 43.5% Zinc and 1.5% Silicon) has been extensively researched, and the proven performance surpasses that of traditional galvanised steel. Weathering stations, set up worldwide through the license authority BIEC, revealed the superior performance of aluminium zinc compared to galvanised steel. Internal tests have also been conducted revealing the same results. The input material prior to coating, Hot Rolled Coil, is 100% recyclable. This is the most recycled material globally by volume, with no down-cycling, which ensures that the steel substrate is of premium quality prior to coating. Safal Steel, as a facility, has installed support lines to the production processes to ensure that the emission output is controlled and minimal. The Acid Regeneration Plant, Effluent Treatment Plant and the Regenerative Thermal Oxidiser have been commissioned to assist in our goal of becoming a fully contained site. Safal Steel employs over 350 staff from local communities incorporating Durban and Pietermaritzburg. Project lap desk: Lap top desks were donated to the Mabhila Combined School and Asizenzele Primary School in the Kwa Ximba community. Social welfare: Snacks and soft drinks were donated to the Mzunduze clinic Open Day in 2009. AIDS awareness: Signage at the factory creates HIV/AIDS awareness, and the company offers free testing to all staff. SANBS: Blood donation days are hosted every 8 weeks. Toy Story: R10 000 was donated to the East Coast Radio Toy Story Campaign in 2010. In 2011 1000 soccer balls were donated to this worthy cause. Asizenzele Primary School: A 12 metre container was donated for additional office/ classroom space. 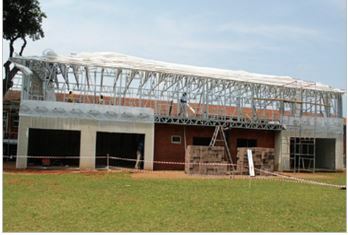 Donations of Roofing Materials: Regular product donations have included material for the roof replacement to the Montrose house; Mpophomeni municipal office Pietermaritzburg, the SARDA Outdoor Arena and the TB clinic at King George V Hospital, and for Penzance Primary School in Glenwood, ZincAL® was donated for the steel structure. Safal Steel continually strives for gold, and are committed to their vision: To be the leading manufacturer and preferred supplier of unpainted and pre-painted aluminium zinc coated coil. To be the leading manufacturer & preferred supplier of unpainted & pre-painted aluminium zinc coated coil. 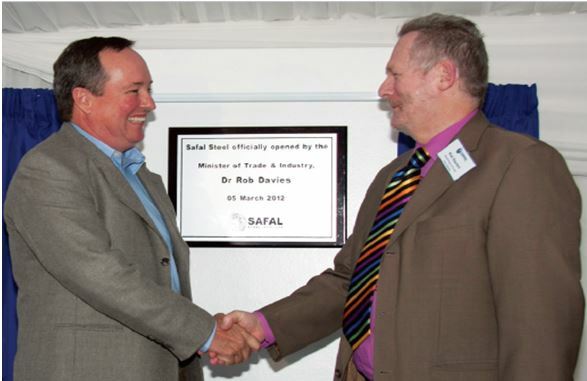 Safal Steel- New aluminium-zinc coating plant officially opened in KwaZulu Natal 5 March 2012.